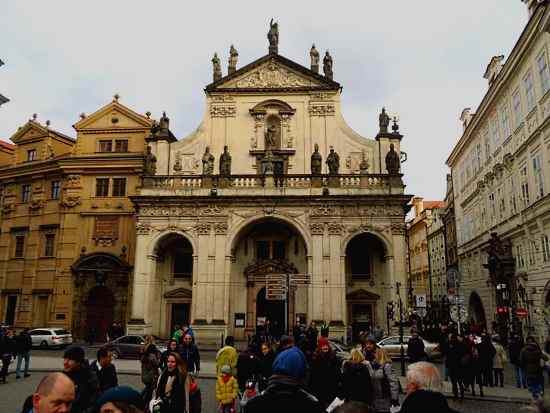 Right next to Charles Bridge on the Old Town side is the Klementinum, a large complex of buildings with a Baroque library, observation tower, courtyards, churches and a Mirrored Chapel. The Klementinum may be hiding a treasure, at least according to a legend. The Jesuits ran the college there from the middle of the 16th century, and over time acquired a fair bit of wealth. 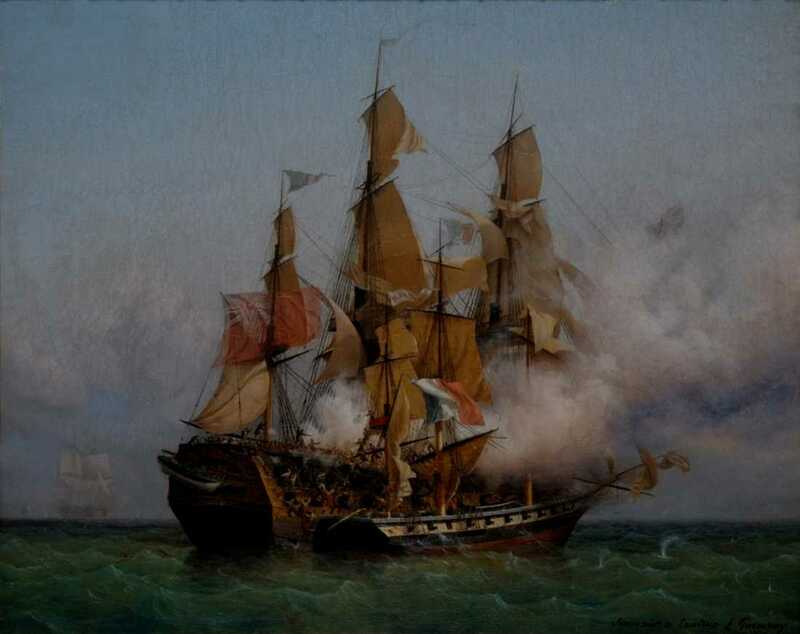 In 1773, though, the Jesuits were told to leave when Pope Clement XIV cracked down on the order. The priests were not only supposed to leave, but turn over all of their wealth to the city. This of course didn’t sit well with the priests. They had seen controversy before, and managed to swim against the tide. The consensus among the priests was that the Pope or his successor would restore the order back to its glory, and the priests could come back eventually. The time for them to leave was quickly approaching, and they hatched a plan. They would hide all of their treasures of gilded and bejeweled chalices, monstrances and the like. Then when they left they would claim poverty and hand over a few token items made of base metal with thin gold plating. They got enough bricks and mortar to create a false wall. But they had little practical experience, and decided they needed professional help to complete the task. Two of the Jesuits dressed up in hooded robes and beaked plague masks left over from the last epidemic, so they looked more like cutpurses than Jesuits. They took a coach to a local bricklayer and knocked on his door in the middle of the night. He was told only the vaguest details, but was offered a substantial sum for a rush job. With a bit of trepidation, the bricklayer agreed. He was hustled into the coach and blindfolded. The coach trip took a long time, as they went in circles and loops to confuse the bricklayer. The real distance was only a few streets. Once they arrived, the same trick was used. The blindfolded man was taken up and down stairs, and through long corridors of the already mazelike complex. Finally he arrived at a dead end, and his blindfold was removed. In the back of the room by a wall, there was a pile of chests and trunks, all stacked neatly. In front of that were bricks and stones of the same type as in the walls. He was to build a wall that matched the original design so it could not be detected. He set out to do what he was told, and by morning the wall was finished. The disguised priests paid the bricklayer in gold coins and warned him that if he ever spoke of his secret work, he would be cursed. Then he was blindfolded and taken back in a similar manner to how he came. The bricklayer thought the whole evening was odd, and after a few weeks it seemed more like a dream — except the money was real. Then in his local pub he heard the story of how the Jesuits were forced to leave and claimed poverty. Nobody believed them but a search of the priests possessions and the Klementinum turned up none of the wealth that everyone was sure they had. The city was even offering a reward for any information that led to the recovery of the missing fortune. The bricklayer put that together with his late night adventure. He went to City Hall, and told his tale. Inspectors went with the bricklayer to the Klementinum, which was now under new management and being used as a weather observatory among other things. They looked and looked, but could not find the corridor with the false wall. The bricklayer didn’t give up though. He managed to get odd jobs there as a handyman and used every opportunity to poke around. But the secret eluded him. In his 80s, he began to go blind and had to retire. But the priests warned him of a curse. After his death, the bricklayer returned as a blind ghost, and he continues to tap around the walls hoping to find the hollow one with the treasure inside. The Jesuits never returned, and the priests who knew the secret seem to have left no map or clues. After the Pope banned the order, Emperor Joseph II passed religious reforms that made it harder for monasteries to operate so the hope of reclaiming property grew dim. 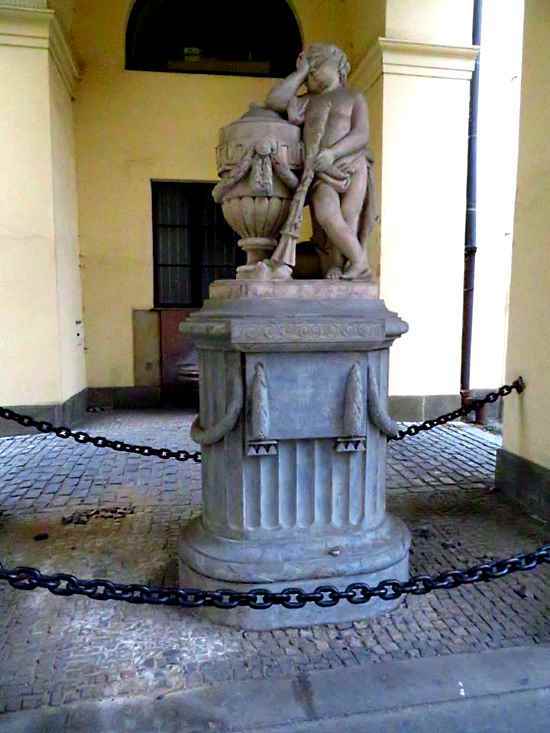 This is not their only treasure in Prague. 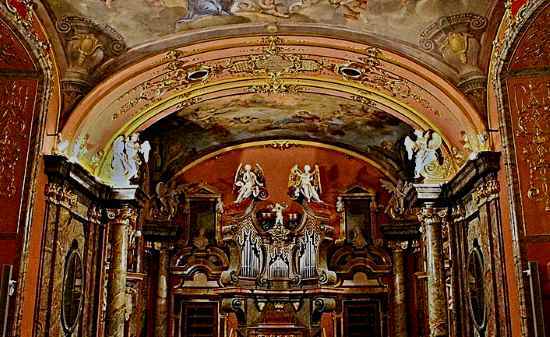 Another tale claims the Jesuits left a fortune hidden in the tunnels under Karlovo náměstí, where the Corpus Christi Chapel used to stand. A tunnel is alleged to have connected the chapel to St Ignatius’ Church, which still stands at the edge of the square. The tunnel was blocked off at both ends to hide any hint of where the treasure lays. The chapel was torn down in 1791, and the foundation was filled in. If the treasure was left in the tunnel there, it has been sitting under the park for hundreds of years. The chapel can be seen in etchings of the square, which was a cattle market. The treasure was not found when the metro was built under the park in the early 1980s. A commuter rail line is planned for the future, and if there is any truth to the legend of the tunnel it may be uncovered then. There is a tale of a third treasure as well. On the site of what it is now the Straka Academy, a neo-Baroque building that is the seat of the Czech government, the Jesuits in 1618 buried an iron treasure chest containing some treasures. But the chest had a curse on it saying that whoever found it would suffer misfortune. A shoemaker from Malá Strana heard about it and decided the risk was worth it. He dug around the area, not far from the banks of the Vltava river, and finally his shovel hit metal. He dragged the chest up to the surface, which was no mean feat. As soon as he started getting the lock open, heard he bells of St Vitus’ Cathedral signaling that there was a fire. Smoke was coming from the street he lived on. He ran to find that his house was completely engulfed in flames. By the time it was put out, there was nothing left. He returned to the site where he had been digging. The chest was gone and the hole had been filled in just as if it had never been dug up in the first place. The shoemaker decided not to dig a second time. 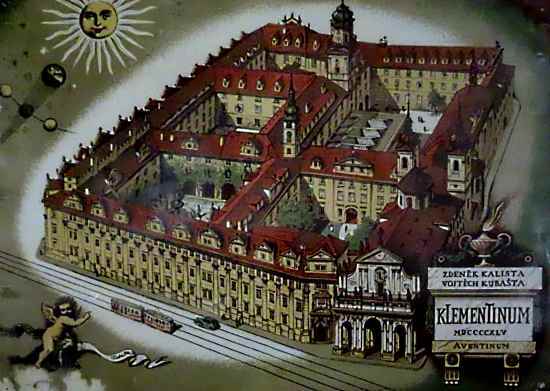 The Klementinum was founded by Jesuits after they came to Bohemia in 1556. The order lived in a former Dominican monastery, but in 1653 started construction projects that lasted 170 years. The Klementinum covers more than two hectares, making it one of the largest such complexes in Europe. Architects included Carlo Lurago, František Maxmilián Kaňka and Kilian Ignaz Dientzenhofer. The Jesuits ran a school there, which in 1622 became a university. The complex included a library, a printing house, a pharmacy, a theater, two churches and chapels. 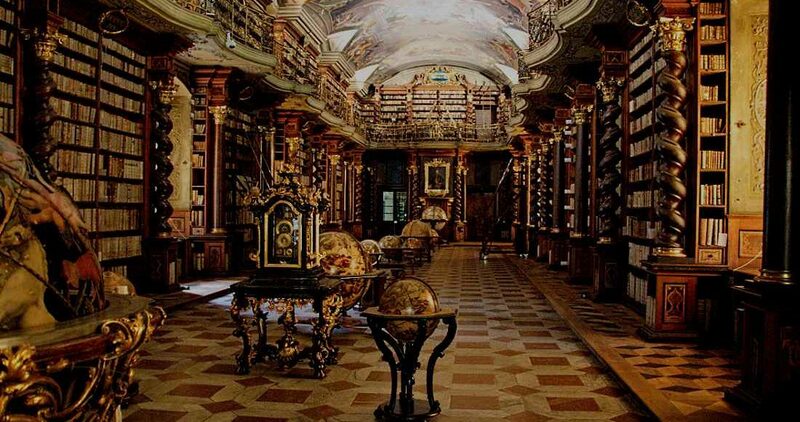 The Klementinum and its library collection merged with the Charles University in 1654. The newly established Charles-Ferdinand University, as it was called, housed philosophical and theological faculties. 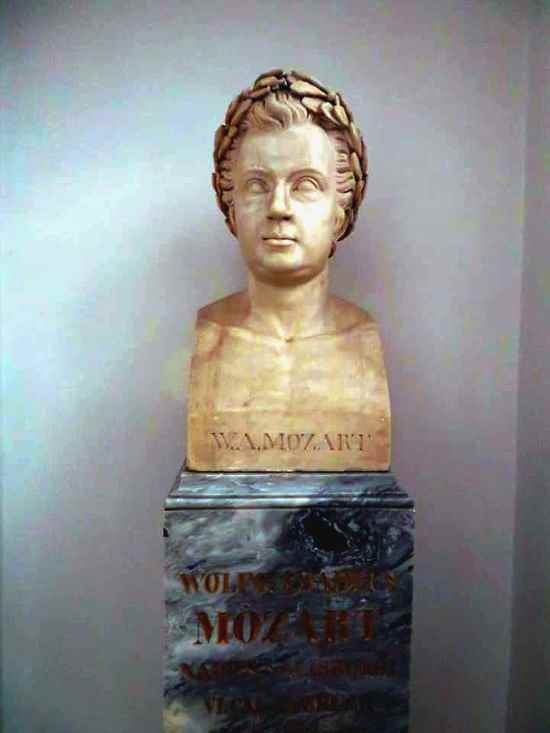 The library has, among other things, an extensive collection of documents relating to composer Wolfgang Amadeus Mozart, and of course works by Czech authors and people who lived and wrote in Bohemia. During the reign of Emperor Rudolf II, the astronomer Johannes Kepler made observations from the Klementinum and lived across the street. The Jesuits left the Klementinum when the order was banned by papal decree in 1773, but the university continued. In 1882, it housed the Czech part of the university when the school divided into Czech and German units. In 1930, the philosophical faculty moved out, and Klementinum became the home of the National Library. 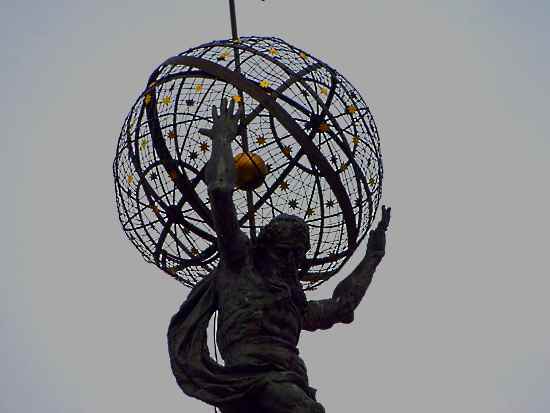 Atlas holding up an armillary sphere on top the Klementinum’s observation tower. Since 1775, the Klementinum has been used for weather observations, and is still the official location for daily temperature. 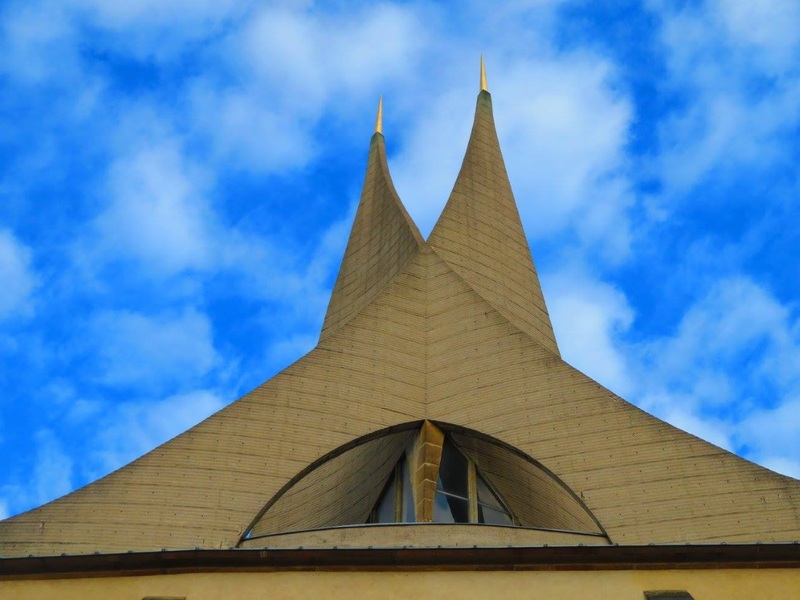 Recently, much of the complex has been closed for long-term renovations, although classical music concerts still take place in the churches and chapels. There has been no word of any discovery of secret chambers. A plaque inside one of the courtyards shows Francisk Skorina, a Belarusian who translated and printed part of the Bible while studying at the Klementinum. 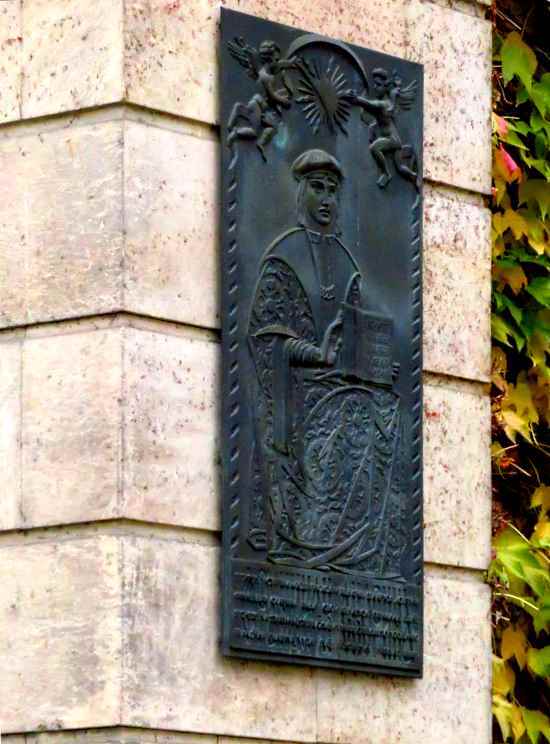 The plaque is used for the figure on the King of Pentacles in The Tarot of Prague. The rooftops of the Klementinum can be seen in the background of The Fool and The Moon in the deck’s major arcana as well as on the Two of Swords. Karlovo náměstí was created in 1348 by Emperor Charles IV when he designed New Town. Karlovo náměstí, or Charles Square, was supposed to be the main square of the district but it never caught on. Wenceslas Square was always more popular. 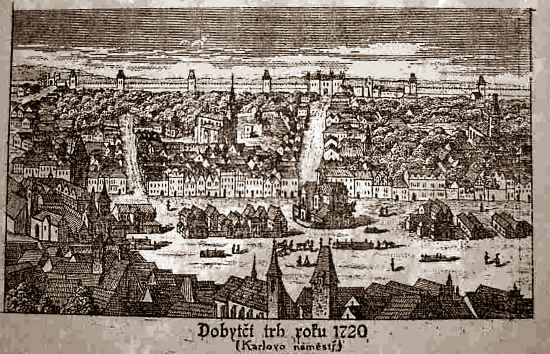 Karlovo náměstí was originally called Dobytčí trh, or Cattle Market. Wenceslas Square was a horse market and a third square was a hay market. 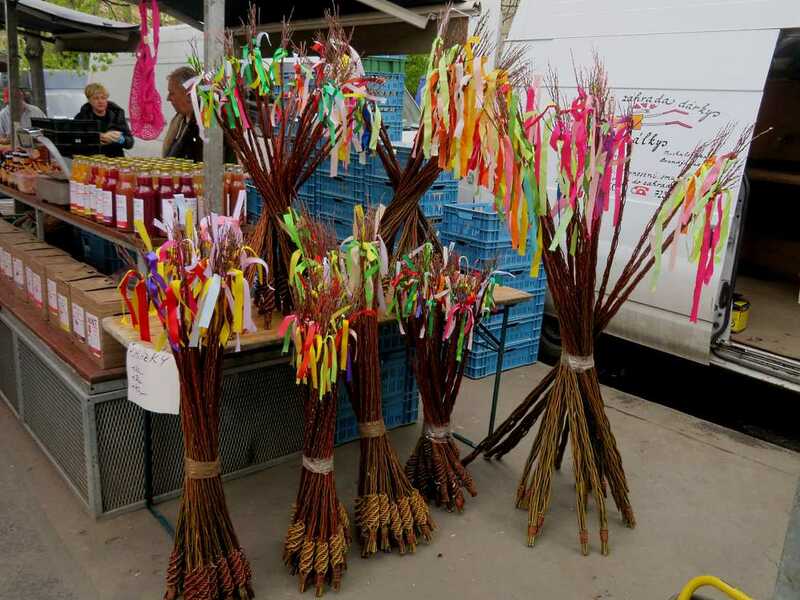 These were in addition to markets in Old Town including Old Town Square and the surrounding streets. The Corpus Christi Chapel was built in the middle of the square in the late 1300s. It closed in 1784 and was demolished in 1791. 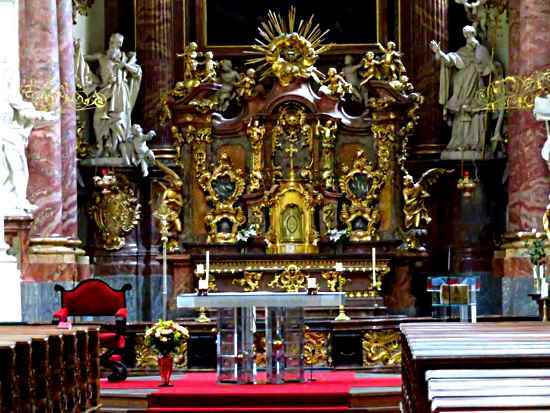 It was a pilgrimage destination in the late 14th and early 15th century, and housed holy relics as well as some of the crown jewels of the Holy Roman Empire. Most of these are now kept at the Imperial Treasury in the Hofburg palace in Vienna, Austria. The Straka Academy (Strakova akademie) was designed by architect Václav Roštlapil and decorated by sculptors Josef Mauder and Celda Klouček. It was and built between 1891 and 1896. The large garden was created under the supervision of František Thomayer. 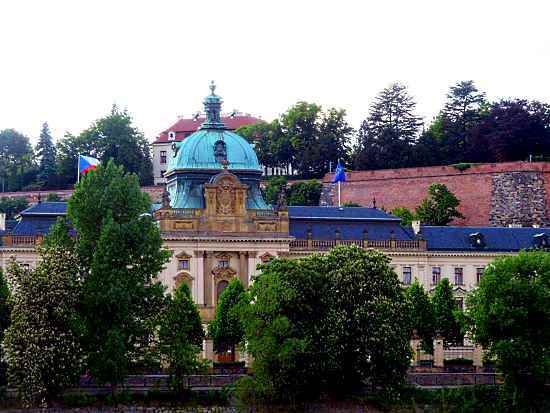 It originally served as a dormitory for impoverished children of the Czech nobility. The emperor’s privy counsel, Count Jan Petr Straka of Nedabylice and Libčany, bequeathed his assets for this purpose in his will. 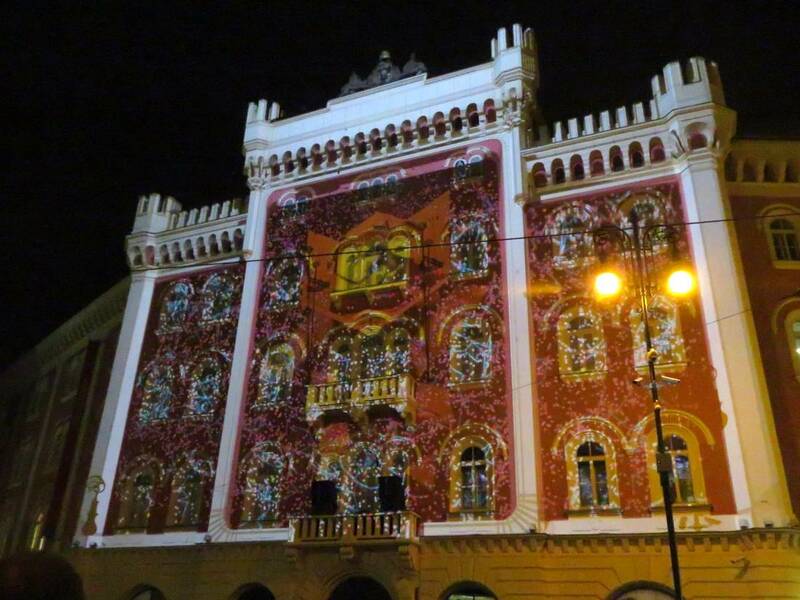 It ceased to be a hostel for aristocrats when Czechoslovakia gained independence in 1918. It went through various uses first as a student club and later as a government building and land court. 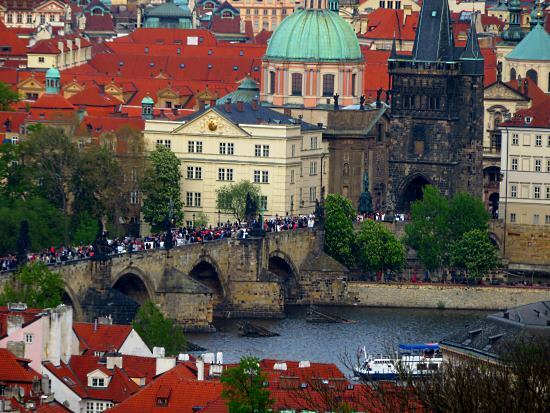 It became the seat of the Czech government Jan. 1, 1993, when Czechoslovakia split up. Remember that these are legends, and should not be taken as historical fact. The Klementinum is a protected landmark and much of it is closed to the public. Damaging walls would be a crime punishable by up to 15 years in prison, a hefty fine, expulsion and a re-entry ban. Karlovo náměstí is a city park. Digging in the grass is forbidden and punishable with fines and possibly also a short prison stretch in extreme cases. Disturbing the gardens around the Straka Academy will land you instantly in trouble as the area is heavily protected by guards and police on a 24-hour basis. Stiff penalties would also apply under a variety of laws, if you could even gain entry.